Dogs from Rescues or Shelters need your help popped up while I was searching for content for another interesting dog story for my pet blog. That’s my title of course. Today I would like to introduce you to The Other End of the Leash a site that has some really great information from many areas of dog ownership that I think you will find very interesting and informative. Please visit them to read the entire story. My interest was piqued when I noticed that these two folks were putting together a booklet for people who do or have adopted dogs from shelters or rescue groups. I will take the liberty to extract just a couple of paragraphs from the site. Please feel free to visit their site and read more. Perhaps you have some input if you are, or have been, a rescue dog parent. Another reason rescue dogs and shelter dogs peaked my attention is because I sell pet transportation and containment items. In other words, strong dog crates. A very high percentage of our sales are for rescue dogs. Rescue dogs usually bring their own baggage from their past which is no fault of theirs. A strong heavy duty dog crate can be a kindness depending on the dogs’ particular issues. Patricia McConnell, Ph.D., a Certified Applied Animal Behaviorist, (CAAB) has made a lifelong commitment to improving the relationship between people and animals. She is known worldwide as an expert on canine and feline behavior and dog training, and for her engaging and knowledgeable dog training books, DVDs and seminars. Patricia has seen clients for serious behavioral problems since 1988, and is an Adjunct Associate Professor in Zoology at the University of Wisconsin-Madison, teaching “The Biology and Philosophy of Human/Animal Relationships.” For fourteen years she dispensed advice about behavior problems and information about animal behavior research, on Wisconsin Public Radio’s Calling All Pets, which was heard in over 90 cities around the country. 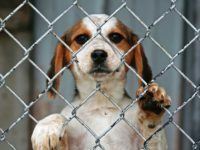 Patricia McConnell, Ph.D. and Karen London are planning on writing a booklet for people who adopt dogs from shelters or rescue groups. They are both aware that often it can be intimidating to sit in your living room with a new family member, whose background you may not even know. Over the many years that they have worked with people who have adopted dogs, and with their own dogs that they have taken in from difficult circumstances (5 between them), they know that these dogs can present challenges, and generate questions that are not often answered by standard training books. So if you have a rescue dog or shelter dog and have input for these fine folks please do share your information and experiences with them, per their outline above by going to http://www.theotherendoftheleash.com/ and leave your comment for consideration for the booklet they are putting together. I know they will appreciate it and you will be helping future rescue dogs, shelter dogs and future rescue pet owners as well. If you have or have had a rescue or shelter dog I know you have information and stories that will help others. Should you be considering the strongest heavy duty dog crate as a potential solution to some of our canine friends biggest problems like canine separation anxiety or canine noise phobia, please click the banner below. We can help. Before you go, please visit this post to enjoy a short video of rescued dogs who are making their human parents and children very happy. I know that “Dogs from Rescues or Shelters” will give you the opportunity to express your very special stories about your rescue dog or shelter dog experience. Hi, I’m currently trying to train my dog (a Japanese Terrier) and I have to say it’s way harder than what I was initially thinking. Do you have any tips on how I could improve?